With Playout, you can give a Live TV like experience to your users. Your users can watch the content those are scheduled in different time slots by selecting various channels. You can create different channels and add content from your Content Library to these channels in different time slots. The content added to the Playout will be played automatically in different channels in different timings just like linear TV. No monetization plan will be applicable to the content added to Playout. Any user can watch the content for free which are added to the Playout. Currently, we do not support Playout for mobile browsers and mobile apps. In Safari browser, Playout starts in mute mode. Users need to increase the volume of their device manually to watch the content seamlessly. To start using the Playout feature, first you need to activate it from Marketplace. To activate the Playout feature, go to “Marketplace” --> “Manage Apps” in your CMS. Then click on “Activate” under Playout. Once the Playout feature is activated you can see it under the main menu of CMS. Note: Currently, we support Playout in Modern, Revo, Traditional and Classic Template. Under "Set the Main Menu", click on "Apps"
Select the checkbox for "Playout"
To add a new channel, go to "Playout" -->"Scheduler" in the CMS. On the right-hand side, click on "Add Channels" button. Type the channel name in the "Channel Name" field. Click on "Select Channel Logo" to select a logo for your new channel. New channel will be added. You can view it in the channel list on the top left-hand side of the scheduler. You can easily delete or edit (change name and/or logo) existing channels. Go to "Playout" -->"Manage Channels" in the CMS. Here, you can also add a new channel. To add a new channel, click on "Add Channel" and follow the steps to add channel mentioned above. To Edit a particular channel, click on the Edit icon. To Delete a channel, click on the delete icon. A window will pop up with “Yes” and ‘Cancel” option. Click on “Yes” to delete the channel. You will get a confirmation message that channel deleted successfully. Click on "OK"
Note: If you have already added content to a specific channel, then the content associated with the channel will also be deleted when you delete that specific channel. However, the content will remain intact in your content library. Users will get a message on the front end when a channel gets deleted. You can select a particular time zone for your Live TV viewers. Select the preferred time zone from the drop down list (See Below Screenshot). It will be the default time zone for all your Live TV viewers. Note: If you will change the time zone then all the content schedules on the time slot will be changed according to the new time zone. Before adding content to Playout Time Slot, make sure that you have content in the Content Library page of your CMS. If there is no content in the Content Library page, then you have to first add content to that page. We support single-part, multi-part and live streaming content in Playout. Note: Currently, we do not support any third party content (YouTube, Vimeo, Daily Motion) in Playout. To add content to a particular channel, select the channel from the drop down list. (See Below Screenshot). Type the name of the content in the “Search Bar” and then select the content you want to add. Select the check boxes “Repeat this Event” if you want the event to be repeated on every week on the same time or once in a day. Select the "End Date" if you want to stop the event repeating after a specific date. You can select "Never" if you want the event to be repeated forever. You will get a message that "Event Added Successfully ". Then, click on "Ok"
You can edit a content of a particular time slot. You can replace the content with a new content and/or you can change the start date and time. You will get a message that "Event Updated Successfully ". Then, click on "Ok"
You can delete a particular content from the Playout Time Slot. When asked for confirmation, click on “Yes” to delete the content. 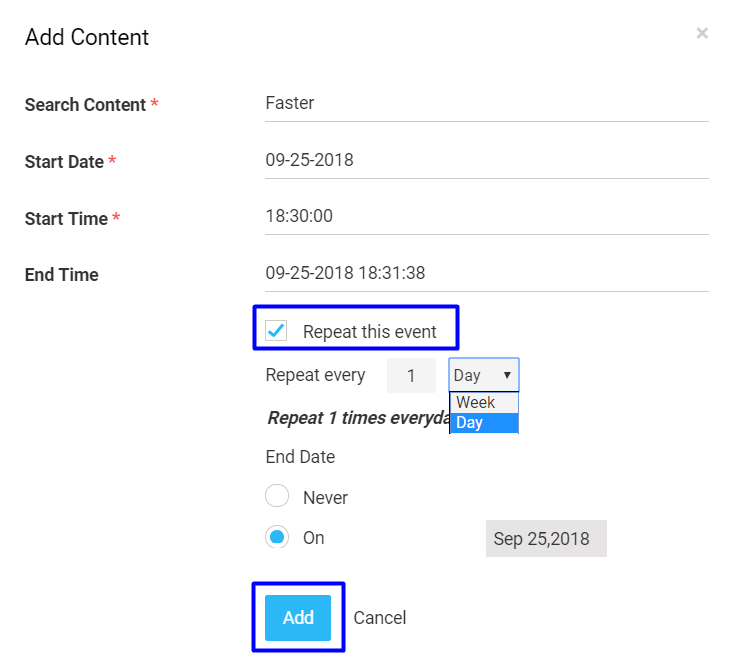 Note: If you have selected the option to repeat the content on every week or every day, then you will be prompted to delete "Recurring Events". If you have no content for a particular time slot or there is a time gap between two programs, then instead of showing a blank screen to your viewers you can add a screensaver image. So, when your viewers open Playout and there is no program or show running at that time, they can see this image. You can also add customized image where you can provide information about the next show to your viewers. To add the Screensaver image, below the “Calendar” of Playout, click on “Update”. Select an image from your computer. This is how the front end looks. Scroll channels by using the vertical scroll bar. You can view the next and previous scheduled programs by clicking on the right and left arrow button. The channel which is playing the content is highlighted in red color. You can also see the details about the program currently playing on the channel on the right hand side of the player. Click on any program to view it's details on the right hand side of the player. The user can play the content from the guide screen itself. If the viewer so wishes he/she can maximize the player into a full screen mode.